Over the past several years I have accumulated quite a few design drawings. Some of the early ones are pretty rough and over the years I have been playing with the style that I use. Dabbling with color and trying to find a combination of CAD and handwork that I liked the look of. All of this experimenting has left me with a pile of disjointed looking drawings. So project number one is to rework all of my existing drawings into a coherent look and format. Not a small task for sure. There are over seventy drawings that will need attention. This works out, to my best estimate, to be in the neighborhood of a couple hundred hours of work. Like I said, no small task. Some of these drawings go back to 2011 and have not been presented here on the blog as of yet. So expect to see a few oldies, but goodies show up here over the next few months. So why bother? Mostly for my own personal satisfaction, but I really want to print and bind them into book form. I never use the originals as working drawings. When I begin a project I currently have to search the computer files and print out the drawing that I want. Usually on cheap copy paper and then throw it away after the project is complete, if it even makes it that far. So I decent, bound working copy of my drawings is high on the list. Then there is the possibility that some you or some future person might find them useful and it would be nice to have them present uniformly. If everything goes smoothly, I want to put together a “fancy” version with full-size prints. Since it is highly unlikely that any publishing company will be wanting to publish my collected works, I’ll be tackling that on my own. To that end, I have begun researching Japanese bookbinding techniques. The technique is actually quite simple, but that simplicity means that the components and execution must be spot on. If you want a quick way to lose you mind, start researching paper sizes, weights and finishes. Then lump in printing options. If you want to make it really fun, try wrapping your head around the Japanese paper variations. Luckily I have plenty of time to sort that out while I’m working on the new drawings. 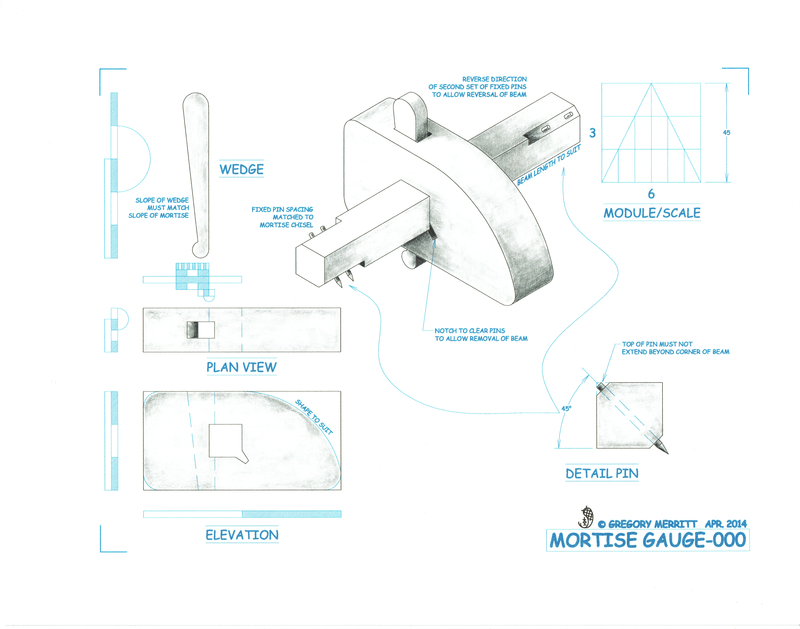 I’ll leave you with an updated version on my mortise gauge design. This entry was posted in Bookbinding, Design, Illustrating, Marking Gauge and tagged Bookbinding, Illustrating, mortise gauge. Bookmark the permalink. Thanks Jose. At the very least I will learn a new skill. I’m pretty excited for you! You have done some really nice work and you deserve to have bound and finished in such a way. If I’m not mistaken you have done drawings for Mr. Sellers did you not? Good luck with this endeavor, I’ll be looking forward to the end result. And thanks for the gauge drawing – I’ll be making a couple of these for certain! I did drawing for PS for a couple of years, but logistics proved to be an issue. I’m kinda partial to this gauge. I have been using the one I built for a few years now and I love it. Sounds like a great idea fun idea. Good luck with it. Nothing like a major project in the middle of all your other projects! You are a very driven man. Good on ya! Ha, most things are on hold until I get this done. The weather has played a big role in that decision too. It has been bitter cold here. Your drawings are really fantastic and you’ve heard me say that before and I’m saying it again. How nineteenth century of you! Were you away somewhere with Rip Van Winkle? Digital is the new way to publish, and it’s very easy to self-publish digitally. Seriously, I’ve always admired your drawings, and recently I’ve been disappointed to see that Paul Sellers has not engaged you for drawings of recent projects. I’m certain you’ll do an outstanding job no matter how you decide to collect and publish your drawings, and maybe ironing the wrinkles out of real paper is easier, and more satisfying, than getting electronic memory bits to align and behave. Hey now. I really wasn’t thinking about mass distribution. A personal copy or two for me and anyone who might ask for one. The process of reworking and scanning all of the drawings will however set me up for digital publishing. When I get that far I may put out feelers to see if there is any interest in such a thing. When it comes time to print your book, consider checking out the Ingram Spark self-publishing program. I recently visited one of their printing factories and was very impressed with the quality of the final product. You could then make copies available to your interested readers! Thanks for the info Luke. Congratulations! I encourage you to this new challenge and 1000 thanks for your generosity in sharing the drawings on your website. They are very useful. Thanks you Xavi and your most welcome. I hope you find something that you may want to build out of my collection of drawings. I’m glad your doing this Greg. You’re drawings are great. Thanks for sharing your ideas for projects too. Your approach to the different projects has helped me think outside the box when I’ve come upon design and implementation challenges.